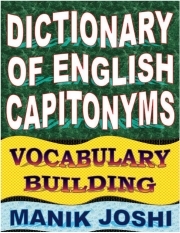 Description of "Dictionary of English Capitonyms (eBook)"
Capitonym is a word that changes its meaning (and sometimes pronunciation) based on whether or not it is capitalized. Capitonyms may be nouns, pronouns, verbs, or adjectives. Capitonyms are case-sensitive words. However, when capitonyms appear at the beginning of a sentence, there is no way to understand which meaning is being referred to except the context in which they are used. Capitonyms also create confusion in the aspect of listening. Because there is no way to understand which meaning is being referred to except the context in which they are used. Capitonyms generally occurs due to one form being a proper noun. Proper noun is a word that is the name of a person, a place, an establishment, etc. and is written with a capital letter. A name of a river/lake/hill/mountain, etc. Reviews of "Dictionary of English Capitonyms (eBook)"